India: What happened to Modi's promise of an economic boom? India's economy in 'downward spiral.' What did Modi get wrong? India's economy, once hailed as a global bright spot, is down in the dumps. Growth in the South Asian nation fell during the first six months of 2017 from 7% to 5.7%, its slowest pace in three years, and analysts say the road to recovery is steep. "We're on a downward spiral," said Mohan Guruswamy, head of the Center for Policy Alternatives in Delhi, and a former official at India's finance ministry. Prime Minister Narendra Modi swept into power in 2014, promising to take India's economy to new heights. But many reforms have yet to materialize and some changes that have been enacted are hurting growth. Modi defended his performance in a speech Wednesday, claiming his government had helped several industries. "It is true that there has been a reduction in growth, but it is also true that the government is fully committed to reversing this trend," he said. "Our fundamentals are strong." India is still reeling from two shocks within 12 months -- Modi's sudden ban last November of 86% of the country's cash, and a sweeping overhaul of the tax system aimed at turning the country's 29 states into a single market. 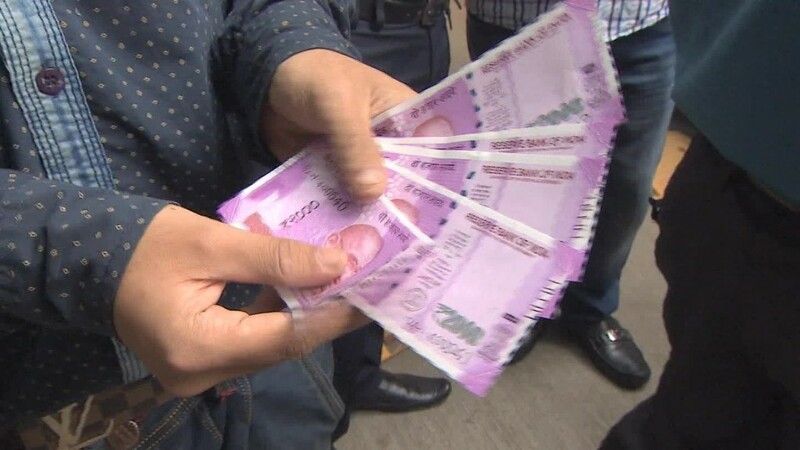 The cash ban "was a massive blow, just when the economy looked at a point of inflection last year and the decline had started leveling off," Guruswamy said. Modi's signature reform -- a national goods and services tax implemented in July -- has been widely hailed as a positive step because it should simplify business in the long run. But the implementation caused major disruption. "My fear was that if people didn't understand how to do the tax system, then they would stop doing business with one another," said Shailesh Kumar, South Asia analyst at the Eurasia Group. "You did see some of that...as companies didn't really know what to do." The government has said it expected a growth slowdown, but appears to have been blindsided by the sharp drop. Top financial institutions are worried that the economy will struggle to regain its momentum in the near term. The central bank has just slashed its growth forecast for the current fiscal year to 6.7% from 7.3%. "The implementation of the [tax reform] appears to have rendered short-term prospects uncertain," Reserve Bank of India Governor Urjit Patel told reporters. The State Bank of India, which is owned by the government, was more blunt. The slowdown, it said in a report last month, is "not short term in nature or even transient." Analysts, business leaders and even members of Modi's own party are now questioning his stewardship of the economy, not just because of the upheaval his changes have caused but also over reforms that aren't happening. "High on the list of priorities is pushing through measures to ease land acquisition laws and liberalize the labor market," analysts at Capital Economics wrote in a recent note. "But there is no clear indication yet that Prime Minister Modi actually has the conviction to push ahead with necessary but unpopular reforms." There have also been calls for an overhaul of the banking system. About 12% of total loans have gone bad, according to official data. Yashwant Sinha, a former finance minister and senior member of Modi's party, wrote an opinion article slamming the "mess" that the Indian economy is in. "A hard landing appears inevitable," Sinha said. Rising Hindu nationalism, stoked by Modi's right-wing party, is also hurting some parts of the economy. In May, the government banned the sale of cows -- an animal considered sacred by the country's Hindu majority -- for slaughter, sending the meat industry into a frenzy. While the ban was suspended by India's Supreme Court in July, the policy confusion has had a chilling effect. India exports vast quantities of buffalo meat. Those exports have declined this year, according to local media. Cattle that once provided a vital source of additional income for millions of India's rural poor have now become liabilities because farmers fear they will be unable to sell them to the meat and leather industry, Guruswamy said. Hindu nationalists have "completely unleashed a reign of terror as far as cattle are concerned," he added. India's Supreme Court dealt the economy another blow in April, banning the sale of alcohol within 500 meters (546 yards) of national highways. Some estimates put the hospitality industry's potential losses at $10 billion. The court eased the restrictions in August, but many within the industry said they had already lost millions. Diageo (DEO), the company behind brands like Johnnie Walker and Smirnoff, said the India ban would dent sales growth. Some of India's top trading partners are taking note. "The space for civil society in India continues to shrink as Hindu nationalism rises," Sen. Bob Corker, chairman of the U.S. Senate Committee on Foreign Relations, said on Tuesday. Corker, who was speaking during a hearing to nominate a new U.S. ambassador to India, also expressed disappointment at the state of the economy. "In particular, I remain frustrated by the slow pace of Indian reforms in the economic sphere," he said. Modi faces an uphill struggle to steady the ship. The most pressing challenge, experts say, is to create the jobs he promised India's large young population. Around 12 million Indians enter the workforce every year, but struggle to find employment. "Poor quality data makes it difficult to put a number on the job woes, but the available data is grim and news stories about jobs losses abound," Ruchir Sharma, chief global strategist at Morgan Stanley, wrote in the Times of India newspaper on Wednesday. Over 1.5 million Indians lost their jobs in the first half of 2017, according to a study by the Centre for Monitoring Indian Economy, and unemployment is on the rise.